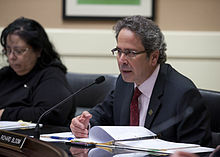 Richard Hershel Bloom (born June 22, 1953) is an American politician currently serving in the California State Assembly. He is a Democrat representing the 50th Assembly District, which encompasses West Los Angeles, Beverly Hills, Agoura Hills, Malibu, Topanga, Pacific Palisades, Bel Air, Brentwood, Santa Monica, Beverly Hills, West Hollywood, Hancock Park, and Hollywood. Bloom is a member of the California Legislative Jewish Caucus. Prior to being elected to the Assembly in 2012, he was Mayor of Santa Monica and served on the Santa Monica City Council for 13 years. Bloom was born to a Jewish family and raised in Altadena and West Los Angeles and attended Fairfax High School, UCLA, UC Berkeley, and Loyola Law School. He holds a B.A. in Communication and Public Policy and a Juris Doctor degree. First elected in 1999, Bloom served on the Santa Monica City Council for 13 years, serving as mayor three times and mayor pro tempore twice. Bloom also served as Chair of the Santa Monica Bay Restoration Commission. Bloom defeated incumbent Assemblymember Betsy Butler in 2012. Bloom serves on the following Assembly Committees: Transportation, Budget, Arts & Entertainment, Environmental Safety and Toxic Materials, and Higher Education. He also serves on Assembly Budget Subcommittee No. 6 on Budget Process, Oversight and Program Evaluation and is the Chairman of the Assembly Budget Subcommittee No. 3 on Resources and Transportation. In 2013, Bloom authored the Bobcat Protection Act, which has since been signed into law. On March 7, 2014, Bloom introduced legislation to ban live performances and captive breeding of orcas. The legislation, if passed into law, would affect SeaWorld San Diego's "Shamu" performances. On November 4, 2014, Bloom was re-elected to a second term with nearly 72% of the vote. In the 2015 legislative session, Bloom introduced legislation to ban plastic microbeads in personal care products. The bill has been signed into law by Governor Jerry Brown. In the 2016 legislative session, Bloom re-introduced legislation to ban captive orca shows. The bill passed both chambers of the legislature overwhelmingly. Bloom resides in Santa Monica with his wife, Robbie Black, a healthcare professional and administrator at Cedars-Sinai Health Center in Los Angeles. He has two young adult children, Zac and Emmett.